What’s the deal with meditation beads (malas)? A lot of Buddhists wear these beads. They look kind of like rosaries, I guess. They’re used in several different Buddhist traditions, but not in all of them. A lot of Hindus and Yogis wear them too. There are long ones that you can wear as a necklace, or wrap around your wrist a few times. And there are short ones that are just bracelets. Sometimes you can identify a meditator by the fact that they’re wearing one. Some people call them prayer beads. Some people call them meditation beads. They can be made of many different things, usually a kind of wood. Mine is made of sandalwood. If you search for malas on the internet you can find all sorts of places to buy them. Traditionally they have 108 beads. If not 108, some number that’s divisible by 108, 54, 27, or 18. It’s a sacred number in Hinduism. And in Buddhism we just kept it. Someone can probably make up some reason why it’s sacred in Buddhism but I think we should admit that it’s one of things from Hinduism that was kept when Buddhism was created. There are those that say there are 108 afflictions that cause our suffering. Maybe 108 does have a special meaning to us, I’m not sure. But it is considered a number that is sacred and important. 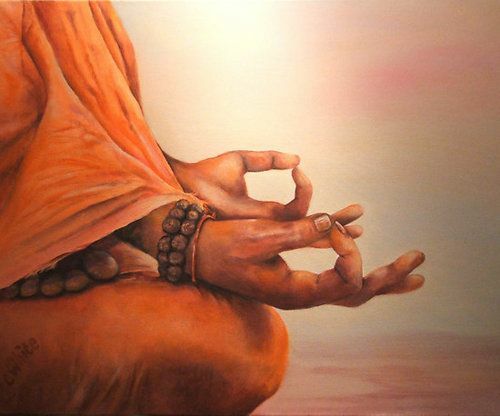 Generally malas are used in mantra practice. When we chant mantras we sometimes chant them 108 times. So, when we chant, OM VAJRASATTVA HUM (a purification mantra), for example, we can move the beads through our fingers to keep track. That way we can keep track and focus on our mantra at the same time. I don’t know how someone would keep track of their number of recitations without one. Mantra practice is not my favorite style of meditation, but I do practice it at least once a week. Malas, of course, have a few other purposes. If a teacher gives you one and blesses it, it can make you feel like you’re carrying your teacher with you. A mala has an extra bead called the ‘Guru Bead’ that is separate from the counting beads. It represents your teacher. I have one that was blessed by the Dalai Lama. Some people think they can provide some form of spiritual protection. One thing is, if you’re wearing this thing, I think it’s a little easier to be mindful. It’s like having a constant reminder that we should be virtuous and mindful. There’s a tendency to be very spiritual in the temple or on the meditation cushion, but not necessarily in everyday life. The path is meant to be practiced everywhere. The world is my sacred space and my spiritual life is not separate from my world life. It can help us recognize each other too. If I see someone wearing a mala, I know we have something in common. I’m probably not going to strike up a conversation with a random person because they’re wearing a mala, but maybe it helps knowing they’re out there. A lot of you may know this story already. I think it’s important for those of us that follow the path of the Buddha to reflect on his life story because he is the example we’re trying to live up to. He was a normal human being, just like you and I. For this reason, we can always remember that we are capable of accomplishing what he did. We all have the seed of Enlightenment. The founder of Buddhism was a Prince named Siddhartha Gautama. He lived in what is India today. At the time that area was a series of small kingdoms—not a large country like it is today. The religious practices that he grew up around would evolve into Hinduism, but the religions of India have changed a great deal since then. The truth is that Buddhism and Hinduism have influenced each other quite a lot in the time since the Buddha’s life. The religion at that time was rigid and strict about certain things. There were, in this time, people who walked away from society to become wandering holy men. Many people did this after they got old, when all of their children had grown up. But, some took the life of the mystic instead of having a family. These holy men believed in finding Enlightenment, outside of the confines of rigid and strict religion. Most of them were devotees of a God called Shiva. Yoga was a creation of these holy men. So was the religion Jainism. And, it was after meeting these holy men that Siddhartha created Buddhism. If we saw these men in the world today, we would think of them as homeless. They wandered from temple to temple performing rituals. They spent hours and hours meditating. Many of them did dangerous practices like fasting. Many of them did not wear clothes. They were motivated to try to attain Enlightenment and they thought that enjoying life would impede that goal. I provided this context so we could talk about the Buddha. Siddhartha grew up in a privileged life. He was born into a noble family. When he was born a fortune teller told his father the King that his son would grow up to either be a great king or a great sage who would change the world. The King wanted his son to follow in his footsteps. So, he made an effort to provide every possible comfort for Siddhartha, so he would never wish for a spiritual life. He thought that in a life of total luxuries his son would not have any yearning for spiritual truths. He would have no reason to be a spiritual seeker, so he would become a great king. Siddhartha grew up with everything he could possibly want. He was surrounded by all the best food, all the best toys, and many women who were willing to indulge his every desire. Would any of us have become spiritual seekers if we had lives like that? I don’t know. There was one moment of his childhood that Siddhartha would remember as very important. He would always remember one day when he sat under a tree as a little boy. He just sat there doing nothing and had a feeling of peace and happiness. This was the moment when he first came into contact with his Buddha nature. This was the moment when the seed of Awakening was planted in his mind. He felt a feeling of oneness, connection to all things. It is the memory of this feeling that would later inspire him. Siddhartha was a young adult when he was able to sneak out of his father’s house to see the real world. He had been sheltered from everything. He took a servant with him and wandered the streets near the palace. In the streets Siddhartha saw what is known as the four sights. He was unaware of these four things in his sheltered life in the palace, so seeing them would change him. The first three sights were an old man, a sick man and a corpse. The servant explained each of these things in turn. Siddhartha was surprised to learn that each of us has to face old age, sickness and death. Up until this point, he had no idea. Then, they call upon an ascetic—a man who had given up worldly pleasures to seek spiritual Enlightenment. This was a holy man and Siddhartha was immediately moved by seeing him. He felt something pulling at his spiritual side. This was the second time that a seed was planted that would lead to his Awakening. The servant explained to Siddhartha that this holy man was dedicated to seeking the cause of human suffering. Siddhartha didn’t really understand but he knew that this experience was important. The servant told him that there were many holy men like this one and they rejected the dominant paradigm of society, seeking to find their own spiritual truths. Siddhartha started to realize that the true nature of life was full of suffering. He resolved to conquer suffering, to unleash his true potential, not just for himself but to help all of the suffering people in the world. Soon after this event he left the palace, leaving all of his possessions and wealth behind. He gave up everything to go out and live the life of a spiritual seeker. He resolved to become a great sage. This was a big sacrifice. Siddhartha’s story sets an example. Buddhism teaches us to give up things that are harmful to us; to give up attachment. Spiritual seeking was so important to him. He had incredible motivation. Siddhartha spent time studying with many of the famous holy men of his day. He studied with teachers who were the forerunners of modern Hinduism and Jainism, but he didn’t find what he was looking for. These holy men told him that he should give up everything that his body enjoyed, so that he would be fully focused on the spiritual life. He tried this, living on very little food and spending days at a time meditating. Ultimately he found that the life of giving up everything didn’t accomplish his goals. It was no better than always indulging in pleasure. He learned from several different spiritual teachers. In each case he stayed with them until they told him they had taught him everything and he realized he had to find his own way. He sat under a tree meditating, focusing on finding the truth. He realized that the truth was within, so that’s where he decided to look. So, he sat and resolved to not get up from beneath this tree until he became Enlightened. He came to a realization that Enlightenment is a middle way—a way between the extremes of self indulgence and self denial. To indulge in every possible pleasure couldn’t lead to spiritual truths. It only leads to a life of constant distraction. To live a life of extreme denial doesn’t lead to spiritual truths either, only to more suffering. We say he discovered the path, but really it was more of a discovery. Buddhist teachings are fundamental truths about the human experience. We can all see them if we look within.